Makeup Geek has grown from a YouTube channel to one of the fastest growing companies in the United States. It takes a lot of hard work and good quality products to get to that kind of status. Tomorrow is the launch of the new duo-chrome eye shadows so what a fitting time to blog about my own collection of Makeup Geek shadows. It all started about a year and a half ago when I was going through my makeup collection and feeling frustrated. I had numerous eye shadow quads that I was only using one colour of and was never that happy with the ever fading pigmentation. I thought that I was being smart about my money by purchasing strictly drug store products. As I got more immersed in YouTube beauty videos, the more I heard about the value and quality of a newer brand called Makeup Geek (MUG). 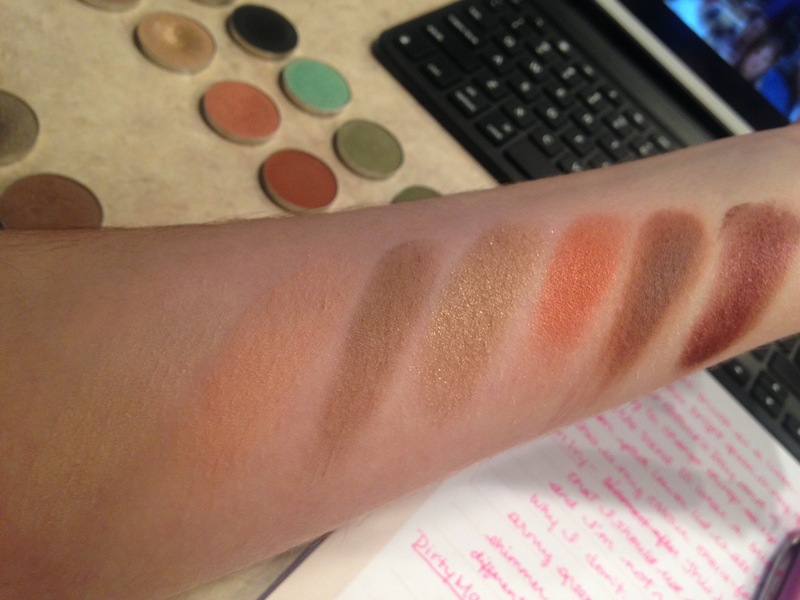 These reviewers were blown away by how inexpensive these shadows were for their high quality. The more I heard about them, the more I wanted my own. 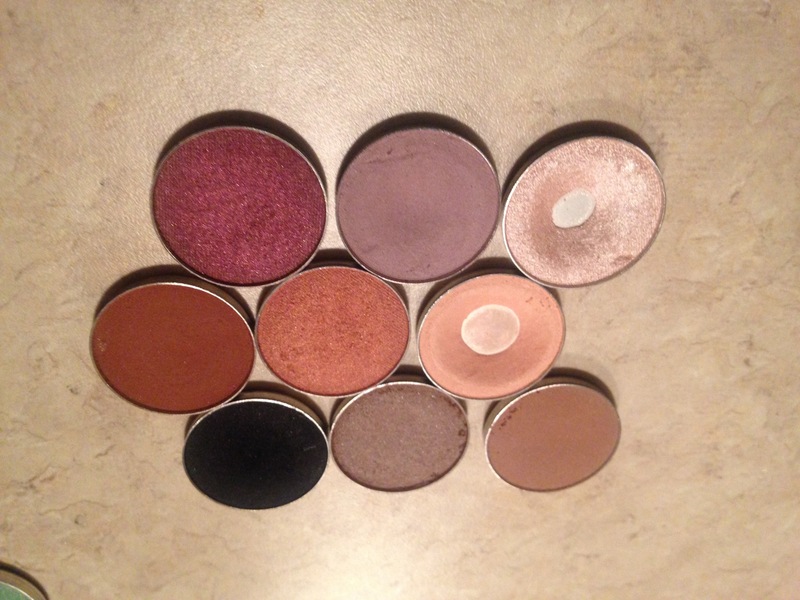 I finally did the math one day and realized that buying quads of eye shadows at the drug store for one colour was much more expensive than MUG’s single shadows. I cleared out my crappy shadows, gaining an immense amount of room in my collection and making it easier to find the other makeup that I still owned. I decided on what colours to purchase based on the colours that I normally wore and those that the beauty gurus raved about. Low and behold, here are my MUG beauties! White Lies – the white colour is a little on the chalky side, but no where near as bad as any of the whites that I have tried at the drugstore. It also lasts throughout the day, unlike the typical faded white that I was used to by midday. I like to use this one in the inner corners of my eyes to brighten up a whole look. Mercury – The light grey colour is wonderful for transitioning just above the crease. It also works wonders on the inner half of the lid when wanting to get gradually darker. I like this colour to transition from a black to skin tone so that it is not such a stark contrast. Graphite – The BEST colour for a deep smoky eye. It has a little bit of shimmer in it and catches the light beautifully. I personally don’t care for eye makeup done with 100% black shadow. This is right up my alley for that dark look without looking like a Dalmatian. Corrupt – The blackest of black shadows right here folks. Unfortunately it does have some fall out. If you are using this shadow, wait and do your concealer after you have cleaned up under your eyes with a makeup wipe. Marlena, creator of MUG, did mention on her Snapchat the other day that they are working on reformulating this colour to make it more creamy so that there is zero fall out. It works great in the outside v of the eye or used with a wet brush to line the eye. Appletini – This bright green is my go-to on Saint Patrick’s Day and a fun way to change things up a bit. As the trend to wear a bright colour on the lower lid is all the rave, this is my preferred colour for that with my green/brown eyes. Poison Ivy – A darker, more army green colour, Poison Ivy is underutilized in this collection. The copper shimmer compliments the different tones in dark eyes. Dirty Martini – A very similar colour to Poison Ivy but in a matte formula. Great for in the office, this could be used in day or night looks. Vanilla Bean – This name is a bit misleading. Vanilla beans are not normally the colour of chai tea latte. I am literally drinking one right now and comparing them in colour. This colour is great under the brow or in the inner corner for matte looks. 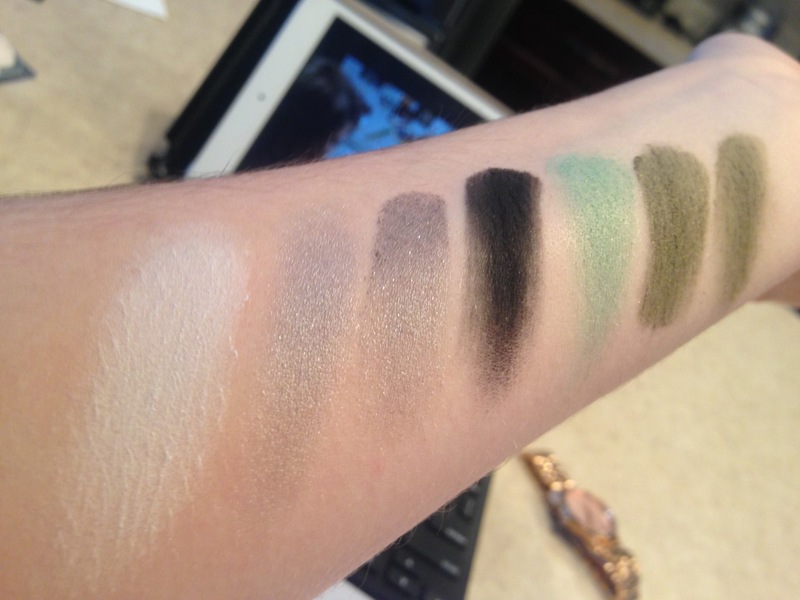 It is hard to see in the swatch photo because it is so close to my arm’s skin colour. Beaches & Cream – Based on the amount of pan that is showing in the feature picture, it is visibly a well loved colour. This tone is a wonderful place to start any look with a sweep in the crease. It works well with other colours and I will need to make another purchase before it runs out. Hipster – A great subdued blending colour for the crease when going for a natural look. Bleached Blonde – A fun gold colour that can be packed on for a glamorous look or loosely swept for a light subdue sparkle. The gold shimmer goes great with brown or green eyes. Goddess – For all those Jaclyn Hill fans out there, this colour screams Jaclyn! I am willing to bet that it will be included in the upcoming palette collaboration with Jaclyn Hill & MUG. It is a copper colour with an amazing creamy and pigmented formula. This is a great colour to catch someone’s attention with for any eye colour. Coco Bear – Named after Marlena’s now fiancé, this is so many people’s favourite colour. It is a little dark in my own preference, based on the lighter eye looks that I prefer to go with. It does blend out incredibly nicely which is why so many people love to use it. Burlesque – This is a beautiful colour. A burgundy brown with a hint of shimmer. Even on work days I like to wear it in my outside corner. Bling – This shimmery beige is almost foil like. It is splendid to bring light under the brow bone or brighten the inner corner of the eye. Crème Brulee – Another wonderful cream colour, it is also great all over the lid during natural looks. Latte – Yet another beautiful crease colour. It has been neglected in this collection but that shouldn’t deter someone from scooping it up. Moondust – A great way to liven your day look up without looking too vampy. It is a brown with a subtle bronze sheen to it. It would be wonderful with any eye colour. Taupe Notch – This light brown/taupe colour is very versatile. It would be a great darker daytime colour or worn on the outside corner of the eyes for a more subdued look. The possibilities are endless. It has a tiny amount of shimmer. Mocha – A muddier version of Taupe Notch, there is zero sheen or shimmer. If you are to chose between Taupe Notch or Mocha, Taupe Notch is a little more versatile than Mocha. 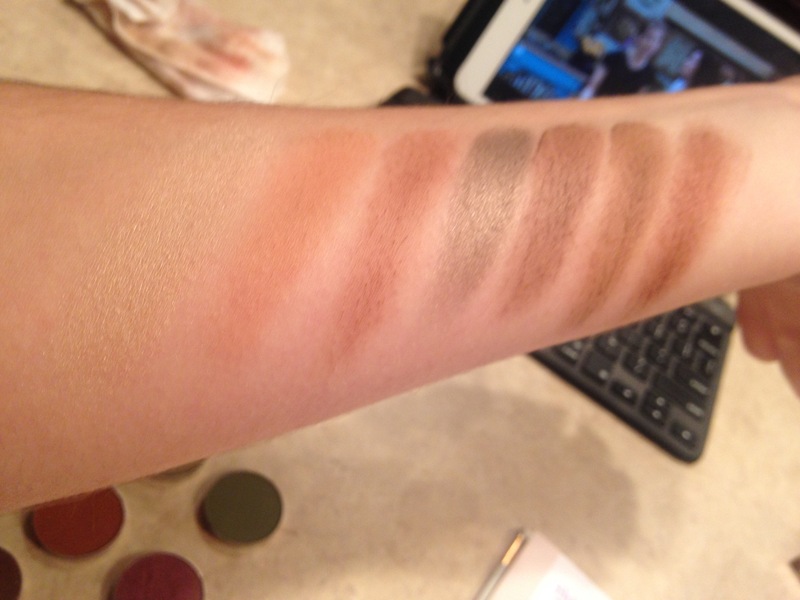 In the pan there is a larger difference in tone than between their swatches. Brown Sugar – The darker version of Latte with a dose of shimmer, this colour is beautiful for any eye but would be particularly stunning on someone with blue eyes. As a brunette with dark eyes, pinks and purples are a necessity for my collection. Shimma Shimma – If you buy only one highlighting shadow, let it be this one. It is beautiful and goes with anything else you decide to put on your eyes. It also works well on cheeks for a highlight with the way that it catches the light and is incredibly flattering. Cinderella – This is a dusty rose colour with a sheen to it. It is a subtle but beautiful colour. If you want to feel dainty, put this all over you lid. Unexpected – It took a good long while to figure out what to do with this dusty purple colour. One evening while watching House of Lies on Netflix I noticed something about Sarah Guggenheim’s eyes. They had depth to them but still looked very natural. I went back to a close up shot of her face and saw that there was a subdued purple in her crease! I knew that I had just the colour for the job. Anyone with brown tones in their eyes and who want an easy way to bring attention to their eyes should get this colour. All you would literally need to do is sweep it in the crease and you are done; automatic dimension. Wisteria – This is a fun colour that goes well on the lid to add some excitement to a brown shadow look. 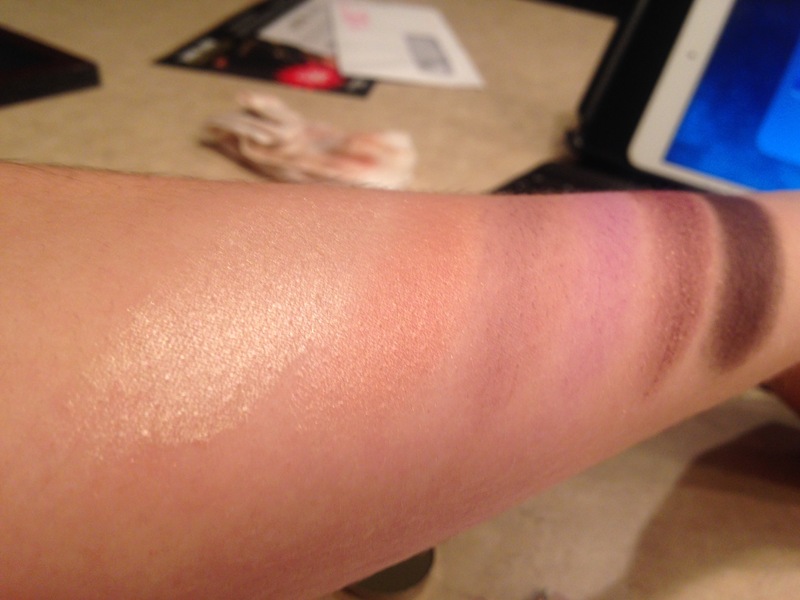 It is very creamy and pigmented but isn’t for everyone. It is not used much in this collection. Sensuous – This is a deep plum colour with a golden shimmer. It is wonderful for a date night to compliment a green or brown eye. This colour works well paired with a black or brown liner. Drama Queen – This is one dark purple! It has a purple shimmer in it as well. Amazing for a smoky eye, but not much else. It would make an interesting liner colour if you are content with having shimmer in your lash line. All in all, these are my personal opinions of what works for me from the shadows that I own, purchased from Makeup Geek’s website. I know that there are so many Makeup Geek lovers out there! Let me know which colours you would suggest that I try as I make room in my collection. I would love to try one of the new foils or duo-chrome shadows. They really look amazing. I love my MUG shadows and cannot say enough about them. I hope that you get as much joy out of whichever ones you decide to get as I do mine.